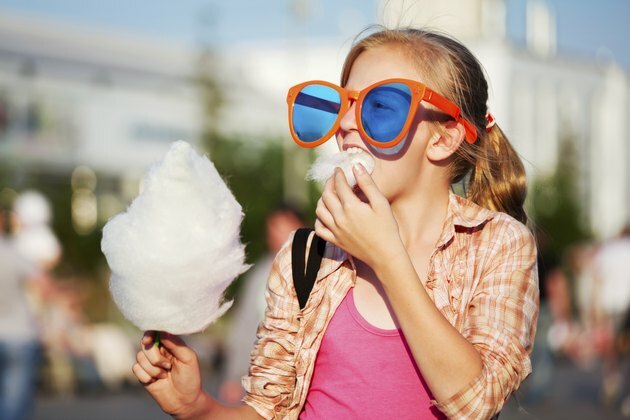 Does Sugar Permanently Stunt Growth in Children? How tall your child grows is largely a matter of genetics, but nutrition plays an important role, too. Without a healthy, balanced diet, your child may not grow normally, explains Jo Anne Hattner, registered dietitian and pediatric specialist at the American Dietetic Association, in Parents magazine. So while no particular ingredient, including sugar, can stunt your child's growth, an unbalanced diet can affect your child's adult height. Eating a lot of sugar won't stunt your child's growth by itself, but if your child is eating a lot of sugary foods or drinking sugar-packed beverages at the expense of other, nutritionally-rich foods, his sugar habit could affect his height. If your child's tummy is full of sugar, he may not have room for the balanced mix of whole grains, lean protein, fruits, vegetables and dairy products that he needs for proper growth. Babies and toddlers have tiny stomachs, so it's important to fill them with nutrient-rich foods. Your child's future height is coded in her DNA -- if she's destined to be short, no amount of vitamins and supplements will transform her into an Amazon. So more important than measuring how many inches your child has grown is measuring her rate of growth. Your pediatrician will chart your child's rate of growth on a chart; when the line flattens out, it can be a sign that her growth has stalled. If this happens, your pediatrician will evaluate her to see what issues -- including diet -- may be causing her growth rate to level out. It's more likely that too much sugar will make your child grow too much in the wrong direction. Too many sugary treats and drinks -- along with an overall unbalanced diet and lack of physical activity -- play a role in the increasing incidents of childhood obesity, explains the Centers for Disease Control and Prevention. Limiting sugar may be a good idea if this is the case for your child -- but never put your child on a diet without talking with your pediatrician first. If your child's growth rate stalls, don't assume that cutting out sugar will solve the problem. Other factors, including food allergies and sensitivities, heart and kidney problems, thyroid issues, chromosomal conditions and even some sleep problems can affect your child's growth. If you're concerned about your child's growth, talk with your pediatrician to diagnose and treat the problem for your particular child. Parents: Is My Child Short?